Science with a squishy twist for every day of the year. 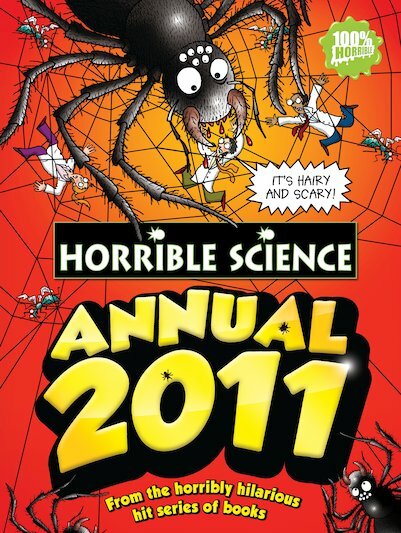 Be warned: the brand new Horrible Science Annual is only for the brave! Dear Reader – welcome to your Horrible Science Annual 2011. And what a sizzling, blistering, buzzing and revolting bundle of scientific shocks it is! Inside you’ll find disgusting diseases, terrifying treatments, stinking insects, really ugly fish, and many truly gory, gross and gruesome experiments. WARNING: this book contains many things that WILL disgust and amaze you, plus oodles and oodles of undeniably foul FUN! Brilliantly funny and very informative. This book is really interesting for people who love science, like me. I also has some very interesting facts that everyone would be very fascinated if they found out about them!